Christmas is all about traditions, sharing the good times and remembering friends and family wherever they may be. A time when everyone takes a break from the rat race by wearing a ridiculous sweater and drinking alcoholic protein shakes ( or ‘egg nog’ as they call it) from anytime after 8.30 am. But have you ever wondered how *everything* else we do has been transformed digital tech, apps and services… but seemingly not Christmas? The traditional Christmas TV family arguments? Once upon a time, we only had a couple of channels to choose from, one usually showing an Indiana Jones or James Bond movie, the other showing a Christmas Special variety show or soap opera. They clashed, causing a TV argument in the pre-digital home. The loser had to rely on the VHS recorder if there was a clash, running the risk of accidentally recording over Airwolf or worse, setting the timer to 4.00 AM instead of PM and getting two hours of static. The traditional Christmas shopping stress? Did anyone really prefer the old days of fighting their way through overcrowded shops lugging a ton of shopping bags? Or arriving home to discover you’ve forgotten that one small, but crucial item without which you’ll have to go back and do it all again, except, by the time you get back it’s sold out? How about spending a day in the supermarket buying enough groceries to feed the extended family, only to discover you can’t fit it all in the fridge? So you’re forced innovate more cold storage by putting bags in the garden… and hope the hungry garden fox doesn’t take a fancy to your 15 packs of mini pork cocktail sausages. Online shopping and next-day home deliveries have transformed Christmas shopping stress. Shareable gift lists, search functionality and algorithmic suggestion options for hard-to-buy-for people, are huge Christmas UX upgrade. And returning things is easier now as well, which is a relief when Uncle Derek sends you Power Rangers pyjamas despite the fact you’re 46 years old. Christmas cards, phone calls and the dreaded Christmas Newsletter? There’s still a certain magic to receiving a Christmas card, although it’s often a mix of touching sentiment and relief you only hear from cousin Mike once a year (sending Christmas wishes from the maximum security prison). But Christmas cards were, and still are, very challenging at times. You have to find time to write them, pay to post them, then realize the Christmas snail mail post is swamped and they don’t arrive on time anyway. In the old days, you could try beating the mail with a phone call. You could call Great Uncle Elmer in San Francisco on Christmas Day… waking him up at 2am local time and costing you a week’s salary on your landline bill. There’s been a big rise in digital Christmas messaging. We all still send cards, but not as many as we used to, and many people we supplement them with personalized Facebook messages and free Facetime / Skype calls. And because social media keeps us in touch all year round, distant relatives / old school chums feel less inclined to send you ‘Christmas Newsletters’, about how they have a much more exciting life than you do. Chalk-up another UX win for digital Christmas. Technology has transformed the preparations, and the mechanics of how we do some things behind the scenes, but the elements that make Christmas feel Christmassy are the same now as they always were. Nobody misses the annual tradition of trying to work out which of the 500 tiny Xmas tree lightbulbs has blown, or electrocuting themselves trying to fix it. No doubt LED lights are a major digital transformation, and a lot safer than putting real candles on a highly combustible oil-rich dry pine tree like they used to way back when. And also, LED has made life a lot easier for outside decorations, with battery power or weatherproof power cables. Because nobody enjoyed hanging a 240-volt extension cable out of their bedroom window, wrapped in a plastic bag, to power their light-up inflatable Santa on the roof… before the rain leaked in and shorted out the whole house. Digital production and configuration tools have created the modern kitchen design, enabling double-oven units that make roasting the veg and meat simultaneously, possible, as well as keeping things warm. Gone are the days of the plug-in electric heated ‘Hostess Trolley’, with all its lukewarm, salmonella-breeding fake-wood charm. And let’s not kid ourselves that getting up at 6am to begin steaming the Christmas pudding for five hours was a better UX than popping it in the microwave for 2 minutes, either. The digital world has made all that stuff much easier. Although dousing the pudding in brandy and setting fire to it, the table and slow-moving elderly relatives is still a common problem with no obvious digital fix. Everyone puts a lot of thought into wrapping presents. It’s how we make the consumer side of Christmas less important than showing people we care about them. There are innovations (like wrist-mounted sticky tape dispensers, and origami gift boxes) but it’s still the thought that counts, and wrapping is still wrapping. Everyone normally opens a small collection of stocking fillers when you wake-up, comprised of a few things you’ll never use, like bizarre deodorant-aftershave combos and wacky kitchen gadgets. Also chocolate coins, small orange citrus fruits and nuts. The big presents, the things you actually want, come later when everyone is together downstairs by the tree. Everyone puts something on the top of their Christmas tree that threatens to destabilize it. It’s often an angel because it’s wearing a dress and therefore easier to stick it on the pointy bit at the top of the tree. But regardless of what it is, it’s generally an item that’s old and has emotional significance, and it requires us to bend the laws of physics to keep the tree upright. Everyone cooks old recipes at Christmas. They could be handed down family recipes or handed down old cookbooks (Delia Smith’s Christmas book is the Labs favourite, published in 1990). Nearly everyone has sprouts, even though they hate them, and the star of the Christmas lunch is usually the crispy roast potato, and brandy butter with pud. 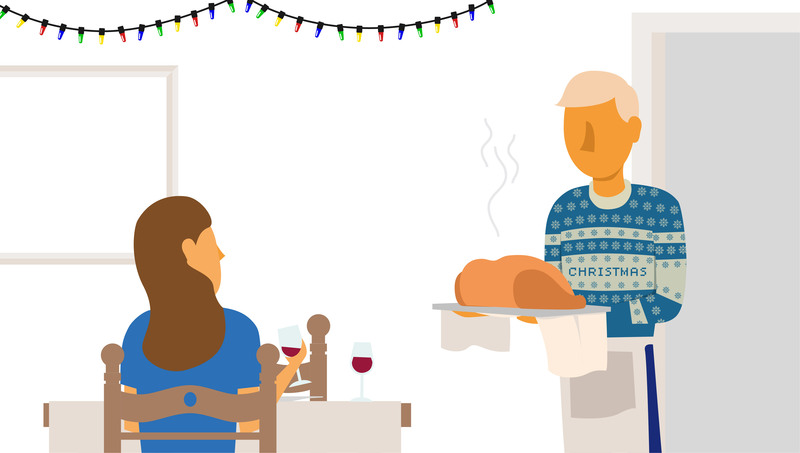 Christmas dinner UX is all about the side dishes and sauces (even if nobody admits it). Everyone plays social games at Christmas. Pulling crackers, reading out terrible jokes, charades, board games… it’s a day of multi-generational, non-digital social gameplay. And it doesn’t matter if you’re rubbish at the game because, hey, it’s Christmas and nobody takes it too seriously. Christmas makes technology social. Everyone has to form Christmas washing-up teams because you can’t fit everything into the dishwasher. Everyone watches / snoozes in front of TV together. We listens to the cheesy Spotify Xmas playlist on Alexa together. Children explain Minecraft to their baffled grandparents, who conversely explain how a nutcracker works to equally baffled grandchildren. Personal tech becomes social, that’s the Christmas UX spirit. Christmas is special because it’s not digital. It’s analogue, it’s social and it’s all about user experiences. Technology has transformed the preparations, and the mechanics of how we do some things behind the scenes, but the elements that make Christmas feel Christmassy are the same now as they always were. You can’t send Santa a digital mince pie and a glass of sherry, or a virtual carrot for Rudolph, someone has to sneakily eat them to prove to the kids that he really did come… down the chimney… with a bulging sack full of memorable user experiences. 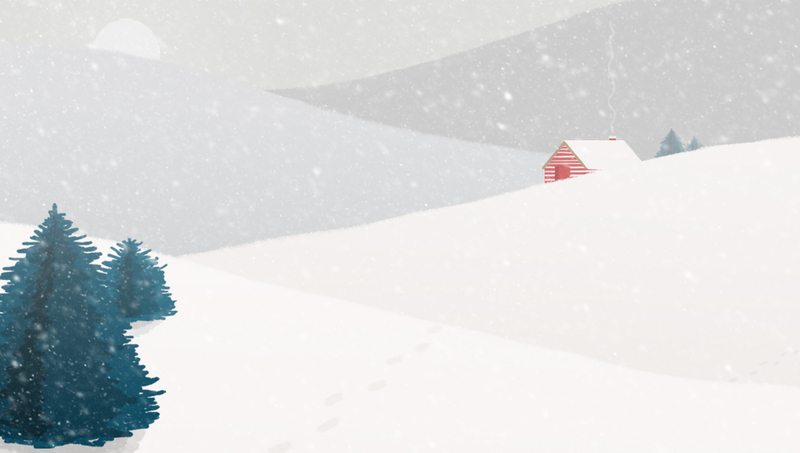 Have a great UX this year, from all of us at the Labs… Merry Christmas!